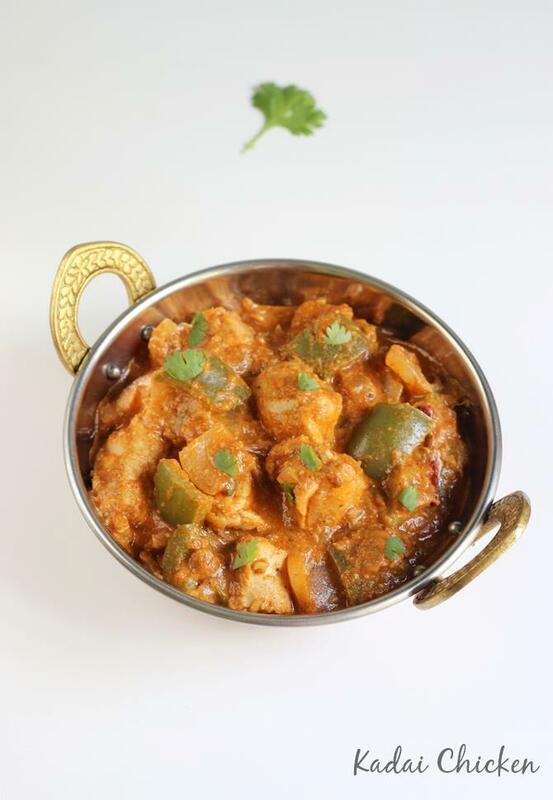 Kadai chicken is a delicious, spicy & flavorful dish made with chicken, onions, tomatoes, ginger, garlic & fresh ground spices known as kadai masala. Kadai translates to an Indian wok which is a most basic kitchen essential in Indian homes. Any dish prepared in an Indian wok using a kadai masala would be named after it like kadai chicken, kadai paneer, kadai mushrooms & so on. 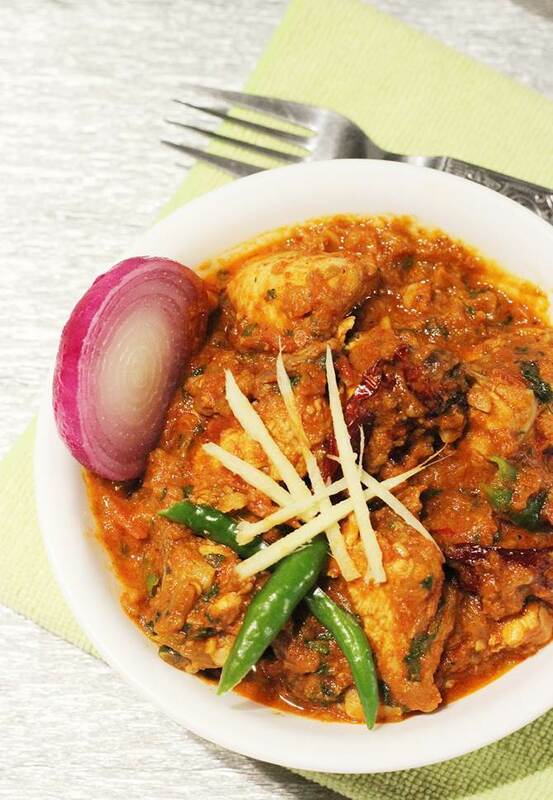 Kadai chicken is almost there on most Indian restaurant menus & is made differently in each place. 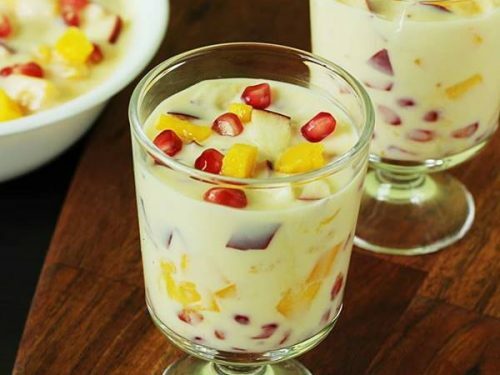 The recipe shared here is roughly adapted from the popular chefs Vahchef and Nita mehta’s recipes. This came very close to what I had eaten in some of the best restaurants and loved it. The fresh ground kadai masala is the key to this yummy and much flavorful dish. There are also so many brands selling kadai masala powder. If you do not have the whole spices to make the kadai masala then you may consider buying one from the Indian stores. Coriander seeds, red chillies & fennel seeds are the 3 main ingredients used to make the spice powder. Apart from kadai masala a small amount of garam masala is also used to further flavor up the dish. Since the garam masala I have used had a good amount of fennel seeds or saunf used, I skipped it while making kadai masala. Kadai chicken looks deep red in color due to the red chilies and deep roasting of the masala. Bone-in chicken tastes best in this recipe as the juices from the bones seep to the curry and make it more flavorful & delicious. However if you do not have bone-in chicken just use boneless chicken like the way I have used. 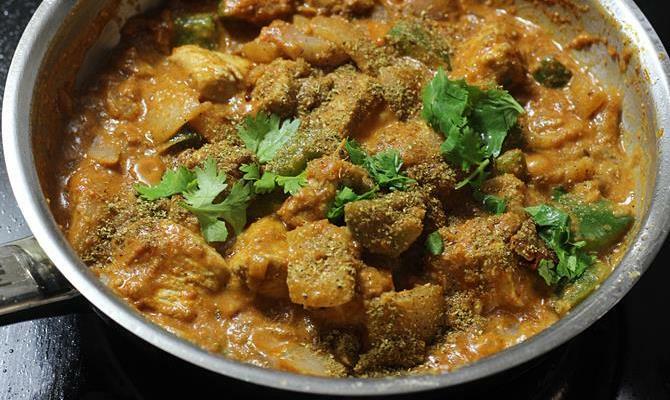 Kadai chicken is made with fresh ground kadai masala. This recipe also details on making it. You can however use readymade kadai masala powder. If you are accessible then just use a regular garam masala. 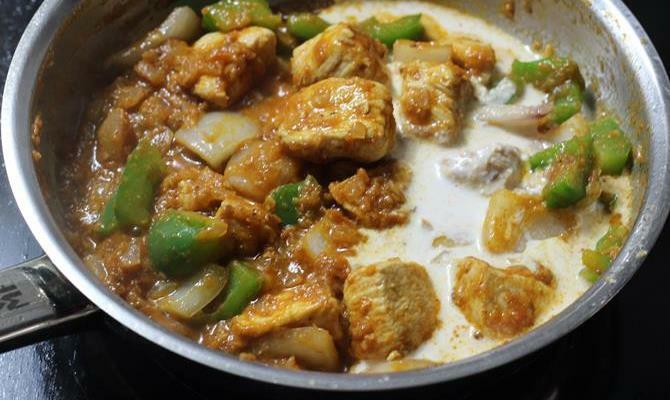 You really cannot get the flavors of kadai chicken but it will still be a very good dish. Most restaurants use cubed onions and bell peppers. However you can also skip them as it is not used in the authentic kadai recipes. 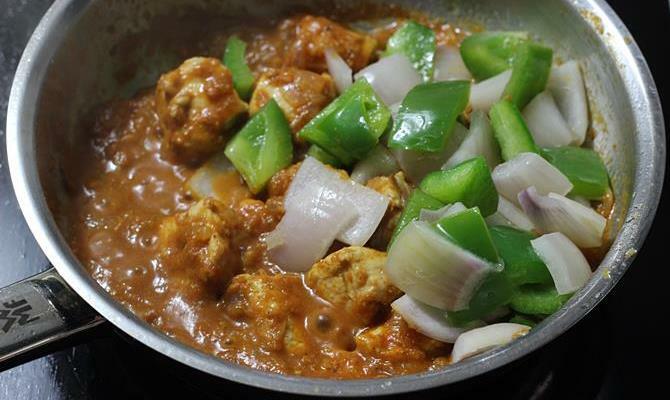 Frying the cubed onions & bell peppers on the highest flame will give a smoky aroma to the kadai chicken. You can skip them and just smoke the dish with a charcoal. Optionally to smoke the kadai chicken, just light a charcoal until hot and place it in a small bowl. Keep this bowl in the kadai. Pour 1 tsp ghee. Immediately the charcoal begins to release smoke. Cover the kadai and allow the cooked chicken to be smoked for about 2 to 3 mins. This post was originally shared in 2013 along with the first picture which I had made without bell peppers & cubed onions. I updated the post with the step by step pictures. Hence there are 2 different pics. 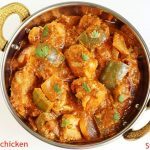 Kadai chicken recipe is an easy and quick North Indian style chicken curry made with fresh ground spice powder known as kadai masala. 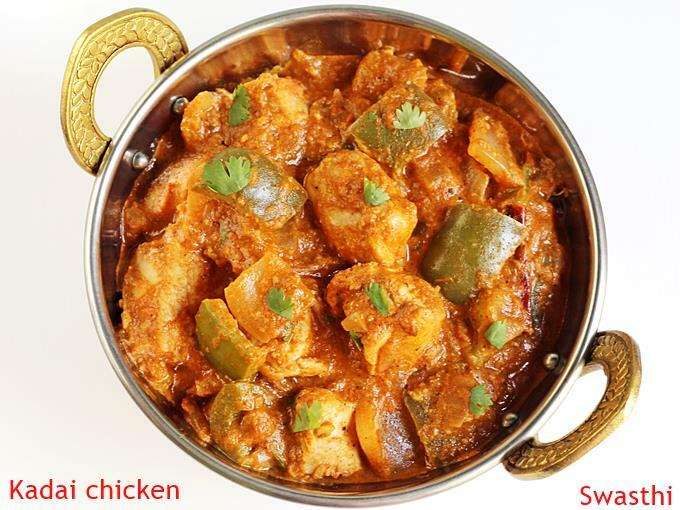 This kadai chicken tastes delicious and very flavorful. 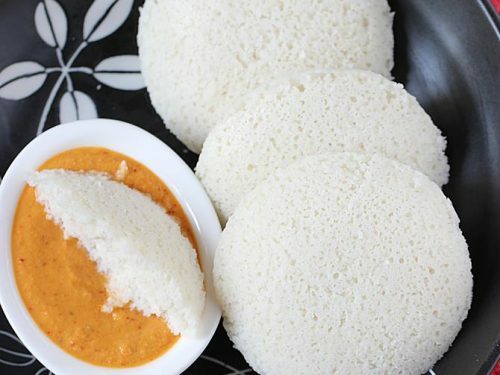 Serve it with some hot rotis or plain basmati rice. Dry roast 1 ½ tablespoons coriander seeds and 4 red chilies until crisp & aromatic. Cool and powder them in a spice jar along with 1 to 1½ teaspoon garam masala. Add ¾ cup chopped tomatoes to a blender and puree them. You can skip this step if u don’t mind using tomatoes directly. Optional : Substitute to cream. You can skip this step if using cream. Soak 10 cashews in warm water for 10 minutes. Then make a fine paste adding little water. Optional: Add 1 tbsp oil to a kadai or wok. 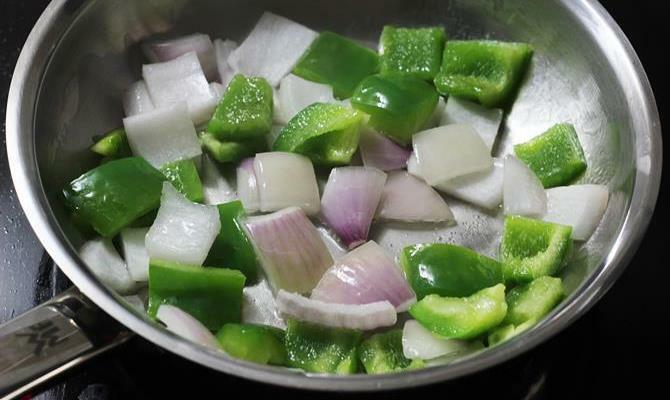 When the oil turns hot, add ¾ cup cubed capsicum and ½ cup cubed onions. Fry for 2 minutes on the highest flame. When you begin to smell them good transfer to a plate. Keep it aside. Heat the kadai with 1 tablespoon oil. Then add 1 broken chili and ½ teaspoon cumin. Fry till the cumin begins to splutter. 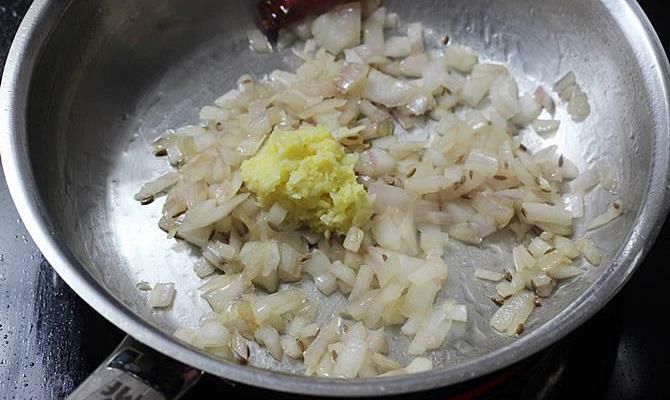 Add ½ cup finely chopped onions and fry till they turn golden. Next add 2 teaspoons ginger garlic paste. Fry till the raw smell goes off. Do not burn it. Add chicken and fry for 3 to 4 minutes. Cover and cook for about 5 minutes. 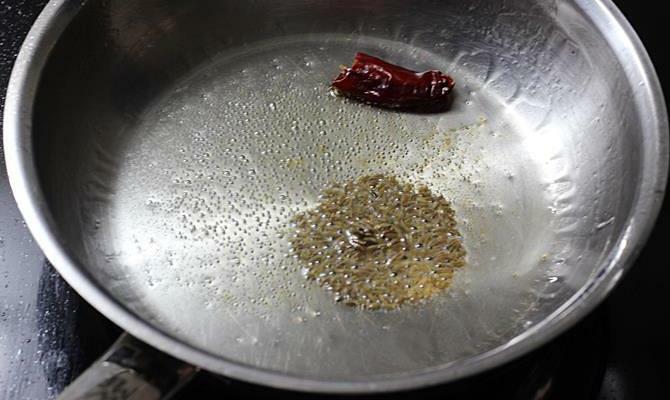 Add kadai masala and ¼ to ½ teaspoon red chili powder (optional). Mix and fry well for just 2 to 3 minutes. Next pour tomato puree, cashew paste and add salt. Mix and cook till the raw smell of the tomatoes goes away. The masala thickens and begins to leave oil. Cover and cook until the chicken is soft cooked. Add sauted onions and capsicums. Mix and continue to cook for 2 to 3 minutes. Cook till the gravy thickens to your desired consistency. If using cream, pour the cream to a bowl. Take a portion of the gravy and mix with cream. Add back to the kadai and stir well. Off the heat. 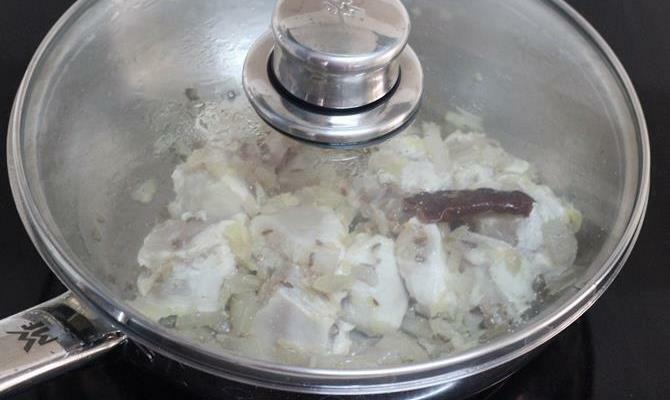 Do not overcook kadai chicken. Capsicum and onions should be crunchy. Sprinkle crushed kasuri methi and coriander leaves. Mix well and cook for just one to two minutes. Off the stove. Serve kadai chicken with rice or roti. 1. Dry roast coriander seeds along with red chilies until crisp. 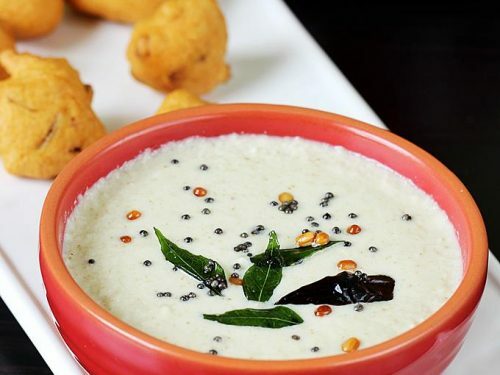 Cool and powder coarsely with garam masala. 2. Puree tomatoes. You can also use chopped tomatoes. 1. This step is optional. Skip if you do not want to use capsicum. Heat a pan with oil. Fry cubed onions and capsicum for 2 to 3 minutes on a high flame. When they begin to smell good, set them aside in a plate. 2. Add red chili and cumin. 3. When the cumin begins to crackle add onions and fry till golden. 4. Time to add ginger garlic paste and fry till the raw smell disappears. 5. 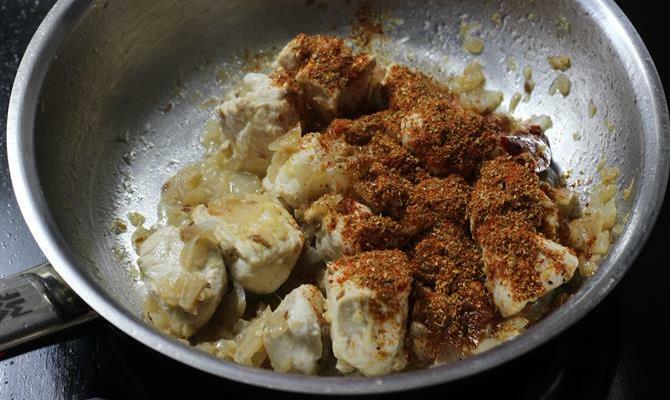 Add chicken and saute for 3 to 4 minutes. 6. Cover and cook on a low flame for 4 to 5 mins. Do not add water. 7. Add kadai masala and saute for another two to 3 minutes. 8. 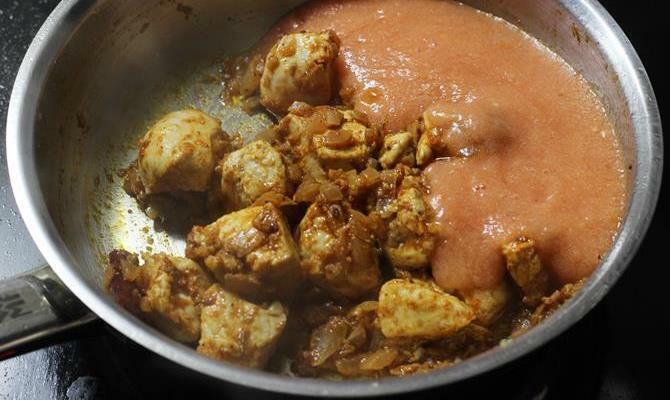 Add tomato puree, cashew paste and salt. Stir and cook uncovered till the raw smell of tomato puree goes away. The gravy also thickens. This takes around 5 minutes on a medium to low flame. 9. Cover and cook until the chicken is soft and fully cooked. Then add onions and capsicums. 10. Mix and cook for 2 to 3 minutes. 11. 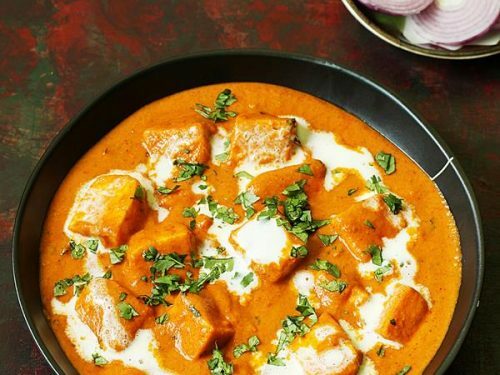 Pour 3 tbsp cream to a cup, add little tomato gravy from the kadai to the cream. Mix and add back to the kadai. 12. Lastly I sprinkled crushed kasuri methi and coriander leaves. Cook for another two minutes. Garnish kadai chicken with coriander leaves, lemon, onion wedges and ginger julienne. Hi! I love cooking….n today i tried ur recipe… just finished…n it is looking so spicy n yummy..😍😍😋😋..
You are welcome. Glad your kadai chicken turned out yummy. Hope your friends loved it. Thanks for the comment and the rating. Just cooked this today for the first time. You made it easy. So glad to know it turned out yummy. Yes you can share the image with me here on Swasthi’s recipes facebook. Thank you. So glad to know kadai chicken turned out good. Thanks for the comment. 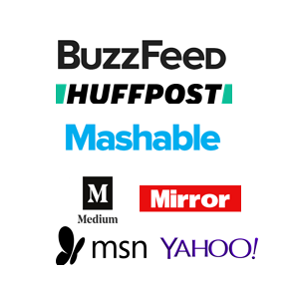 I’ve been using your website for a while now and everything I’ve cooked has turned out great! Thank you for the deliciousness. While I’m making kadhai chicken today and I know it’ll be good, I also want to say that the first and the only time I made aloo gobi the way I want it to taste, has been from your recipes. Much appreciated and kudos! You are welcome. So glad to know the food turned out good.Thank you so much for the kind words. Sounds yumm… Trying to make using 1 Kg boneless chicken. Are these quantities correct? I did try the same as you mentioned. But didnt work out. Niether the taste nor the gravy. Sorry but something is missing. I am sorry not sure what didn’t’ work out. 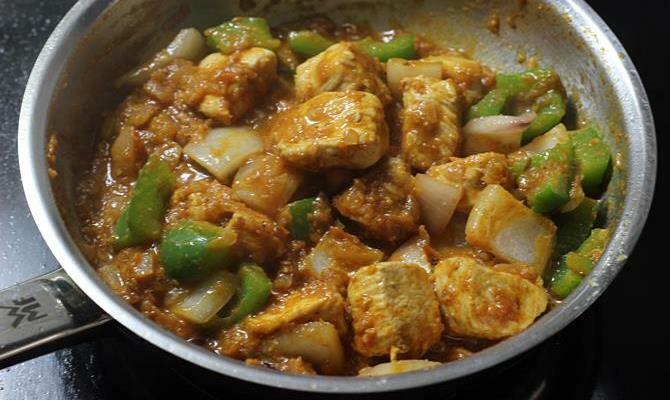 If it is not hot and flavorful, you can make some more kadai masala and add to the chicken. Cook for some more time. hi, your recipes have been life savers, especially since I got married. Just wondering if I am using store bought Kadai masala, how many tsps or tbsps can I use? My husband has been a fan of every recipe I tried from this website. Thanks a ton! You are welcome. So glad to know the recipes have been useful. The best thing is to check on the pack for the recommended quantity of masala. Some are very strong so a little would be enough. Usually most ready made masala packs specify how much to use for a certain quantity of meat. Just follow that. love your recipes. I try to cook as per your instructions as i am a big follower and fan of your recipes. I am a starter though but my husband is a real foodie, so i keep trying. Your recipes are simple but tastes awesome.Tried kadai chicken yesterday, Tasted really good. Thanks for such wonderful recipes. Sorry I forgot to reply your comment. Thanks a lot for trying the recipes. i am very glad to know they are useful. Yes you can add turmeric. I forgot. Thanks for the mention. Big fan of your recipes..simple n tasty recipes… Made this kadai chicken.. It was super tasty.. Thank you so much Mam.. Thanks. Chicken has to be cooked to soft, when you prick it with a fork, you should feel it is soft. If you do not cook it well at this stage, it turns hard after adding tomato. How long to cook depend on the size of your chicken pieces. Cook until it is tender & soft, stirring in between. Hope this helps. Do we have to marinate the chicken beforehand or put it straight away? How will the salt go inside the chicken if no marination is done? This is a slow cooked kadai chicken. Cooking on a low flame for long time helps the chicken to absorb salt, spice etc. 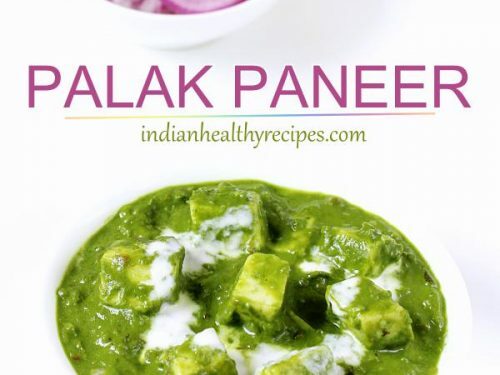 If you prefer you can also marinate it with salt, ginger garlic and 1 tbsp of curd. Hi, thanks for this recipe. I have a question. 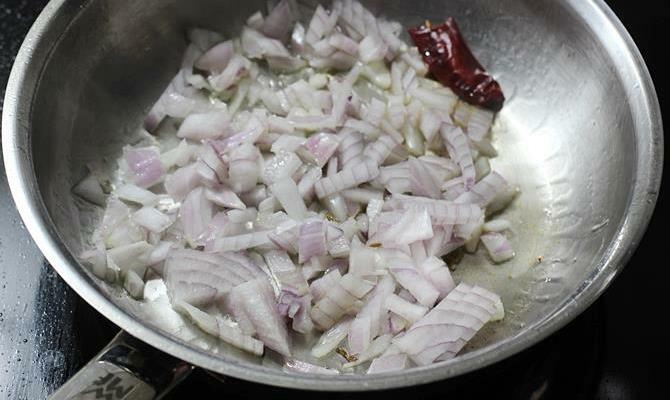 You fried onions in the begininning with capsicums and then fried another batch of onions after the cumin seeds. So how much onions at each of these times do we need to use? You have been my saving grace past an year, though I make ur recipes whenever run out of ideas, this is the first time I thought I have to acknowledge you(been lazy to type n fill up the boxes these days). 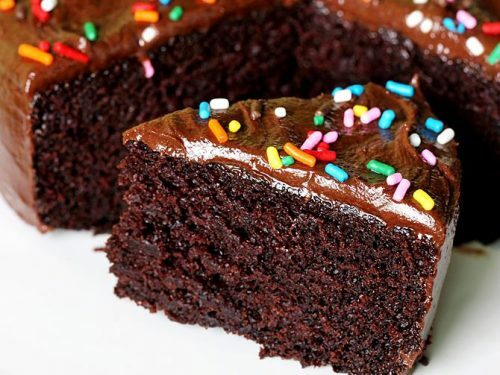 Thanks Swasthi n a ton thanks coz my husband is a foodie n I am saturated with recipes my mom gives, you post so beautifully with each and every step, making it easy to cook by amateurs like me like a piece of cake. Very very pleased to read your comment. Thanks a lot for the love and the wishes. I am on a long vacation so could not reply you.